Save $500* on a Disneyland® Resort vacation package with a 4-night hotel stay and a 4-Day Disneyland Resort Park Hopper® souvenir ticket. This package gives you time to enjoy two amazing Theme Parks filled with favorite attractions, shows and more. Save $500 when they buy this 4-day, 4-night vacation package that includes a 4-Day Disneyland Resort Park Hopper souvenir ticket and a 4-night stay at one of the Hotels of the Disneyland Resort. Book this offer Nov. 1, 2011 – Feb. 26, 2012, for arrivals most nights Jan. 2 – Feb. 26, 2012. When you check in at one of the three Hotels of the Disneyland® Resort from Jan. 4 to Feb. 29, 2012, each person in their party will receive two Disney’s FASTPASS® tickets, per stay. 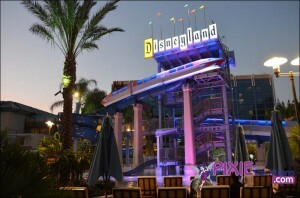 Offer includes two (2) Disney’s FASTPASS® tickets for each registered guest (ages 3 and older) per Disneyland® Resort hotel reservation for arrivals from 1/4/2012 through 2/29/2012. Separate theme park admission is required. Each Disney’s FASTPASS® ticket will allow a guest one (1) entrance to the FASTPASS® return line of any Disney’s FASTPASS® attraction at the Disneyland® Resort Theme Parks (except World of Color). Tickets expire seven (7) days from check-in or 3/7/2012, whichever occurs first. Disney’s FASTPASS® attractions and return lines may not operate daily and Disney’s FASTPASS® tickets are subject to attraction changes, closures and capacity. No cash value; no substitutions. Tickets may not be sold, copied or transferred for commercial purposes and will not be replaced if lost or stolen. Subject to restrictions and change without notice. *Savings based on the non-discounted price for the same Walt Disney Travel Co. package of a standard room for four (4) nights for a family of four (3 adults and 1 child (age 3-9) at a Disneyland® Resort hotel with 4-Day Disneyland® Resort Park Hopper® souvenir tickets for each person. Offer is valid for most nights with arrivals from 1/2/12 through 2/26/12 when booked from 11/1/11 through 2/26/12 with travel being completed by 3/1/12. Offer applied once per package/reservation; not valid for suites or for previously booked rooms. Check for offers associated with different package lengths of stays. Excludes applicable taxes and fees. The Disneyland® Resort Park Hopper® Tickets expire 13 days after first use or 6/10/12, whichever occurs first, and each day of use of a ticket constitutes one full day of use. Tickets may not be sold or transferred for commercial purposes. Subject to availability as the number of rooms allocated for this offer is limited; advance reservations required. Limit two (2) rooms per reservation and five (5) people per room. Not valid with any other discount or promotion. Subject to restrictions and change without notice.